Then in moments of pause I wonder about whether the quickness of published pieces – those introductory yet central experiences of encounter with loose poems here and there, or a translator’s commentary in a journal – truly gets so much sensation across. The quickness of Escobar’s mind and life are out there, in his writing. Will readers find them? Beyond the bounds of the poems themselves come the contexts, offering guidance to new readers. Angel Escobar’s widow, Ana María Jiménez, has pointed out that existing Spanish-language commentaries around his life and death tend to flatten his representation in their repetitions of certain themes. For example, these themes don't tend to include the happiness we see in the 1987 photograph above. It’s a good reminder to translators – and in parallel fashion, scholars writing critical studies – to periodically pause and take the measure of all these things we create. Our renditions of literature and their paratexts (all those ubiquitous bio notes, plus the commentaries, blurbs, translations of essays by other poets on the relevance of the person or work, the scholarship and so forth that serve as companions to literature) travel in fragmented forms through the worlds of publishing. Where these write-ups successfully pursue some theme with great determination, that very pattern of emphasis causes other possibilities to fade. Below I ask Angel Escobar’s friend who appears in the photo above, artist Nelson Villalobo / Villalobos, to share reflections expanding on ideas that are available in English to date; I also reprint a poem in which Escobar draws on their friendship. In the picture above, the friends appear in Nelson's home and studio in Havana, San Miguel del Padrón; and that setting seems quite relevant to the poem, "Collection / Colección." Escobar’s book Abuso de confianza, or Breach of Trust, is forthcoming from the University of Alabama Press in 2016. Escobar has other strong books; I chose to bring this one into English first because of the impassioned recommendations I heard from many island poets with diverse approaches to writing. Breach of Trust delivers an existential, resistant NO!, paired with a fragile assertion of the right kind of yes, a balance deeply important to many readers of the Spanish. Meanwhile, commentators regularly comment on the painful and tragic strengths of this book in tandem with Escobar’s 1997 suicide. And so proceeds Escobar's canonization. The pattern follows a powerful tradition in island poetry of linking literature with death, one that transcends the individual and speaks to a community. José Martí is the most famous precursor in this recirculating canon, so in a sense, it’s quite an honor for Escobar to be perceived and described within a similarly powerful cultural dynamic. Escobar dialogues beautifully, and significantly, with the Cuban canon in Breach of Trust and other books. An extraordinary combination of literature and death is perfect for comprehending the appeal of his resistance through poetry: Escobar spans centuries and skewers the 20th century in particular, his own terrain in time, in Breach of Trust. But even a kaleidoscopic appreciation of his NO can obscure dimensions of his yes that should not be lost, particularly if there's any hope of comprehending his poetry in relation to the everyday -- first the importance of how anyone gets through the mundane time in everyday life, and then the importance of a different everyday involving illness and Escobar's extended daily battles for survival. As a result, I think that his widow has a point. A canon, in the end, is only a tool. A usable mythology enabling some useful conversations, regardless of how mystical and sacred the tool may come to seem. Moments arrive again and again for breaking away from it to pick up another tool, to speak to an audience with other priorities. Anita, Escobar's widow, has spoken of her sense that his need and love for music and art have been muted topics in the conversation emerging to date. Rapid lines: pain, pardon; revelry, life. the sky black above, tautological blue, only uproar. among tables and padlocks; cruel too, everything teems. style that self-parodies and seeks its own shelter. escapes, conceals itself. We’ll see those figures again. We’ve paused in our nostalgia for perfection. to make them positive; in the middle, cruel affliction. The motifs have been observed. The light returns in silken lines. sparks with light and recollection, auscultates. Líneas rápidas: dolor, perdón; jolgorio, vida. Nos hemos detenido en la nostalgia de perfección. hacerlos positivos; en medio el quebranto cruel. Ya se acataron los motivos. Vuelve la luz con sus caireles. que enciende y rememora, ausculta. Translated by Kristin Dykstra with the permission of Ana María Jiménez de Escobar (heirs of Ángel Escobar). Spanish originally published in Cuando salí de la Habana (1996). This poem and an earlier version of its translation appeared in a dossier dedicated to Escobar in Sirena: Poesía, arte y crítica in 2010. For a time I wasn’t sure why Escobar dropped the “s” at the end of his friend’s surname in this and other writings. It’s the the kind of minor detail that I mentally red flag – a misinterpretation at this level can lead to errors of thematic association, and then to escalating errors in the notes or essays I might write about the poem and more. This absence of the “s” didn’t seem to be a mere typo, since Escobar repeated it in various places. To see more about Villalobo/s online, you can go to his own site or to pages maintained by family: the Villalobos Cine site, maintained by Nelson's son Pablo, or here to "Todo se moja menos la lluvia" (Nelson's daughter Daisy Villalobos Leal is also a poet, who remarked over email that Escobar is a major influence). 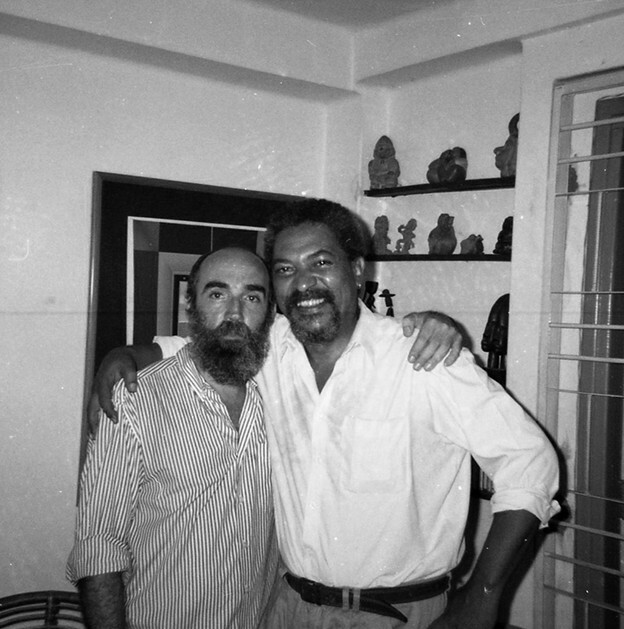 Lastly, Villalobo/s is the photographer who took this shot of Escobar, which appeared on the back of the original edition of Abuso de confianza. The book was published in Chile prior to its republication in Cuba. Jiménez has expressed concerns directly to me in the past, as we discussed permissions and translations. Juliet Lynd also interviewed Ms. Jiménez in Chile and wrote this excellent article about their conversation, touching on the dilemmas that occupy me here. See “Reflections on a Conversation with Ana María Jiménez, Wife of Ángel Escobar,” in Sirena: Poesía, arte y crítica 2010:2 (126-136).